Professional photographers don’t care about how expensive the camera of their dreams may be, because they will recover their investment gradually, if they’re into photography as a business. 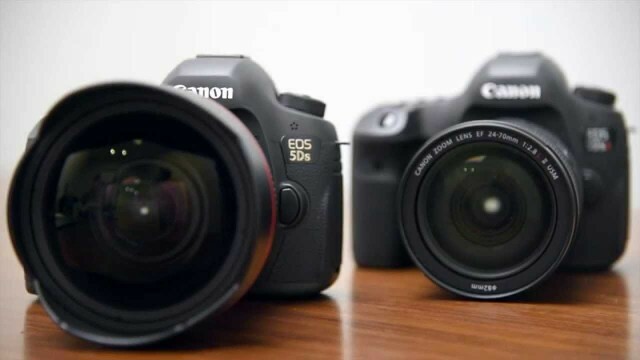 $3,700 is a decent sum, considering the specs that the Canon EOS 5DS comes with. But, before deciding to throw your money at this camera, get the right lenses for it. 5D is a line of DSLR cameras from Canon that targets a category of photographers, who are neither professionals nor amateurs, but which can obtain high quality images with a camera that supports 50.6 million effective pixels and whose price is reasonable. Why would you need a high resolution like 50MP? Well, the photos that you can take will be printed at a very large size. For example, Canon EOS 5DS has 300ppi, and the images will measure 73.56×49.04cm (28.96×19.31inches), which are very large. There are two downsides for cameras with higher pixel count: the images contain lots of noise and they demand more processing power, affecting the continuous shooting rates and the burst depths, which are reduced. But, the good news is that Canon tried to avoid these problems by equipping its 5DS and 5DS R line of cameras with processing engines. Also, higher resolution means larger files which fill up your memory card pretty fast. If you take raw files with your Canon 5DS at the highest resolution, their sizes will be between 52 and 82MB, while the JPEGS files will have 10-29MB, and when you transfer them to your hard drive, you will need to wait a lot longer and your computer will be slowed down as well. 5DS is almost identical to 5DS R, but they have different sensors. The 5DS R has a 35x24mm 50.6MP CMOS sensor which produces more detailed images and has a “cancellation” filter which gives more detail, despite of the low pass filter that is over the sensor. The role of a low pass filter is to soften the image by reducing the risk of moire patterning, but if it’s removed, you’ll get interference patterns that will repeat when shooting. Canon’s 5D Mark III has a single Digic 5+ processor, while the 5DS has two Digic 6 processors, which allow the native ISO range to be expanded from 100-6,400 up to 50-12,800. The 5D Mark III has a native ISO range of 100-12,800 which supports expansion up to 50-102,400. 5DS’s Burst Mode (continuous shooting) allows a maximum speed of 5fp, while the 5D Mark III supports a speed of 6fps. One of 5DS’ Picture Styles is called “Fine Detail” and with it, the users can capture awesome landscapes or macro objects, Canon added a collection of mirror lock-up options which can be accessed via the menu. The 5DS doesn’t have a headphone socket likewise the 5D Mark III, this makes it a less recommendable camera for video shooting. But the new camera comes with a compensatory feature, an intervalometer built in, and it’s able to shoot timelapse movies. The 5DS lacks Wi-Fi, but it has an optional Wireless File Transmitter add-on, and Canon improved the new camera in a way to reduce vibrations, by strengthening the base plate and tripod mount of the device. – 61-Point Automatic Selection AF. To select any of them, you will need to press the AF Point Selection button which you’ll find on the back of the device, then, to go through the options, you’ll use the Multi-function (M-Fn) button, which is located near the shutter release. You will know which option you’ve selected because the AF point is illuminated in the viewfinder. The optical viewfinder is very large on the 5DS and it indicates cropping when shooting 1:1 formats and 1.3x and 1.6x crop images, but the camera shoots 16:9 or 4:3 images only with Live View. If you’re using manual focus in Live View, your on-screen image will be magnified by 6x or 16x, but you must enable the Mirror Lock-up mode because when touching the camera, you’ll introduce a lot of wobble. The 5DS camera has physical dimensions of 152×116.4×76.4mm, it weights 845g (body only) or 930g (CIPA guidelines); it has a 3.2inches LCD with 1.04 million pixels; it captures RAW images at 50MP, M-RAW images at 28MP and S-RAW images at 12.4MP; the magnification is 0.71 times and the eye point is 21 mm; it has grid display, EV-2 support, Itr AF, Anti-flicker, Bulb timer, Face recognition during live view, it shoots videos at 1920×1080 30fps (ALL-I or IPB) and it’s powered by a LP-E6N Lithium-Ion Battery (7.2V, 1865mAh).